Juniors Test Milton Boards at Track Nationals! 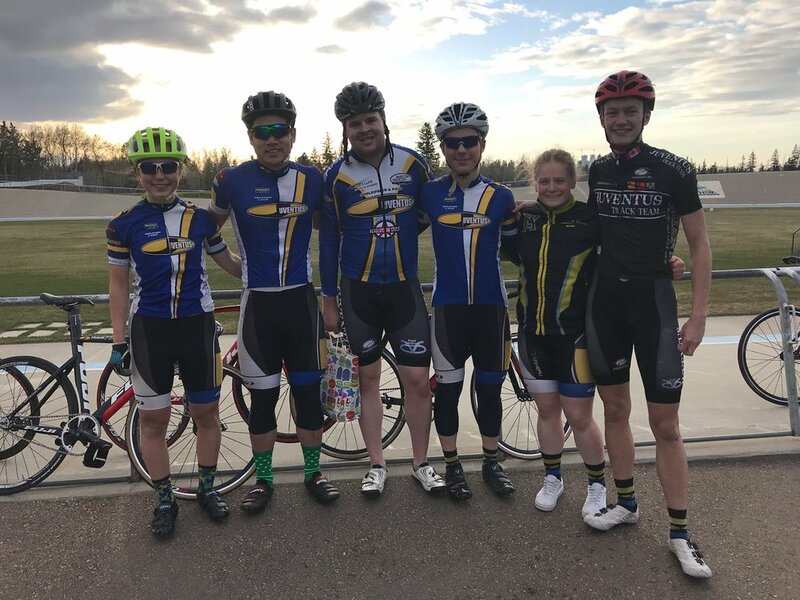 When you live and cycle year-round in Edmonton, it is slightly counter-intuitive to learn Junior Track Nationals are held in April. After all, Argyll Velodrome is outdoors, and April is the month we typically begin outdoor training and racing. 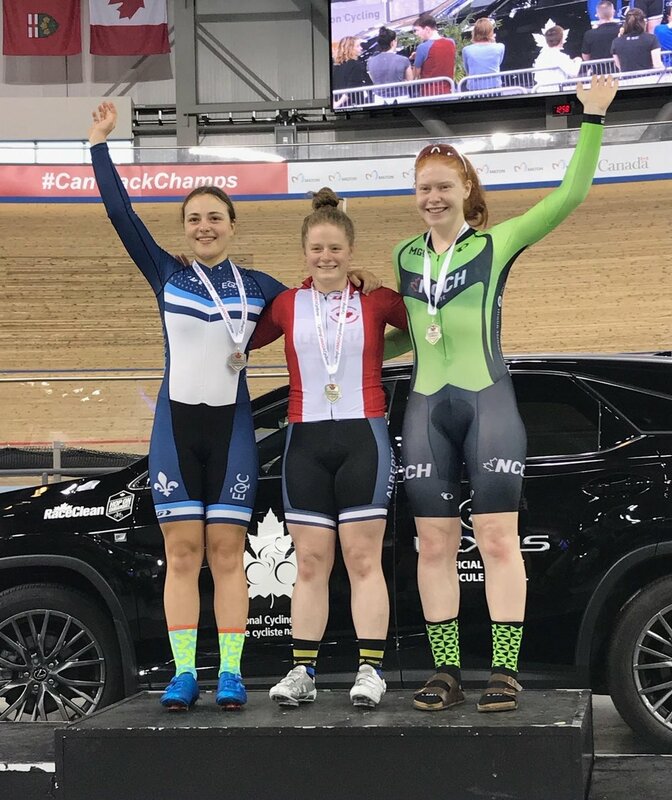 However, this makes some sense: there are Junior World Track Championship selections to consider, and having the event in the spring gives riders at selection age access to Canada's only 250 m indoor track - with time to prepare and develop at future camps. Winter training means rolling indoors; however, Argyll cannot be beat on a warm summer day. Juventus Juniors and U17s trained with dedication and intensity over our long, LONG, cold winter. They rolled the long rides to nowhere; in the clubhouse, at home, back to the clubhouse, back home, hauling bikes, hauling equipment - all to get fit, all to get fast. They trained with Jeff at track sessions, with Alex at AVRA sessions, and with Tracy at junior sessions. They did a lot of work. Here they are! 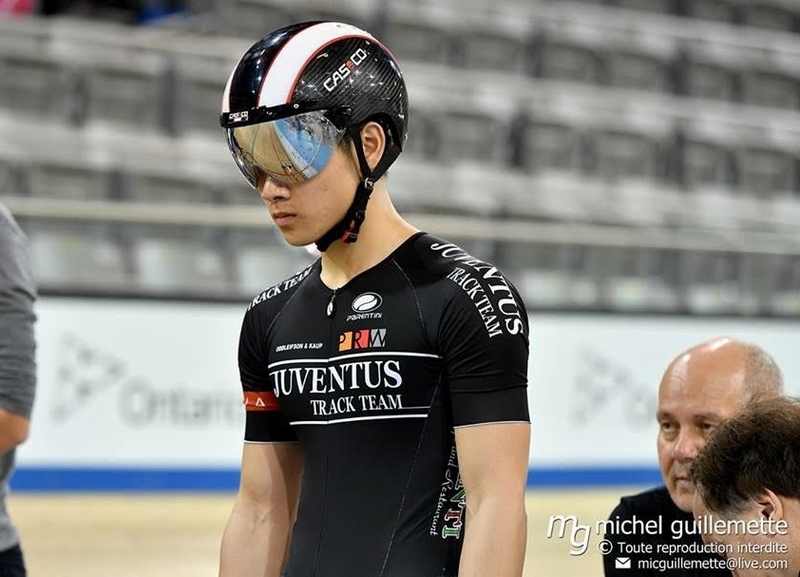 Our Juventus Team to 2018 Junior/U17 Canadian Track Championships. Lukas, Mat, Adam to manage things, Mikael, Chris, Alex, Abbey, Ngaire, and Annie. Finally, 8 of our Juventus youth were ready to head to Milton, Ontario for the 2018 Junior and U17 Canadian Track Championships! Annie Scott U17-1, Ngaire Barraclough U17-2, Mikael Goh U17-2, Lukas Bonkowsky U17-1, Abbey McGill Jr-2, Alex Webb Jr-2, Mat Meurer Jr-1, and Chris Heinemann Jr-1 packed bikes, rollers, helmets, shoes, wheels, and gears. Together with a team of dedicated parents, and team equipment manager Adam Todd, the group flew to Toronto, loaded the rental van, and drove to mythic Milton (unfortunately, Alex arrived sick and had to return home). As you can imagine, Juventus youth represented our club and province with humble tenacity. Juventus raced the entire gambit: Match sprints, Keirins, bunch races, Madison, Team Sprint, and Team Pursuit. They learned every race, adjusting to the smooth, wind-free, 250 m wooden track. Abbey proved to be a tactical bunch racer, Annie figured out which wheels were safe to follow, Ngaire learned how to take advantage of her sprinting ability, Mikael found out a thing or two about the track compared to roller riding, Lukas realized he really liked to race -and that the neutral lap can be critical in an elimination. Mat and Chris had the opportunity to experience junior national level of competition - and managed to work and get comfortable. They worked VERY hard. All of our youth came away inspired - and a whole lot smarter. Performances also yielded our latest U17 National Track Champion: Ngaire Barraclough won the Points Race! 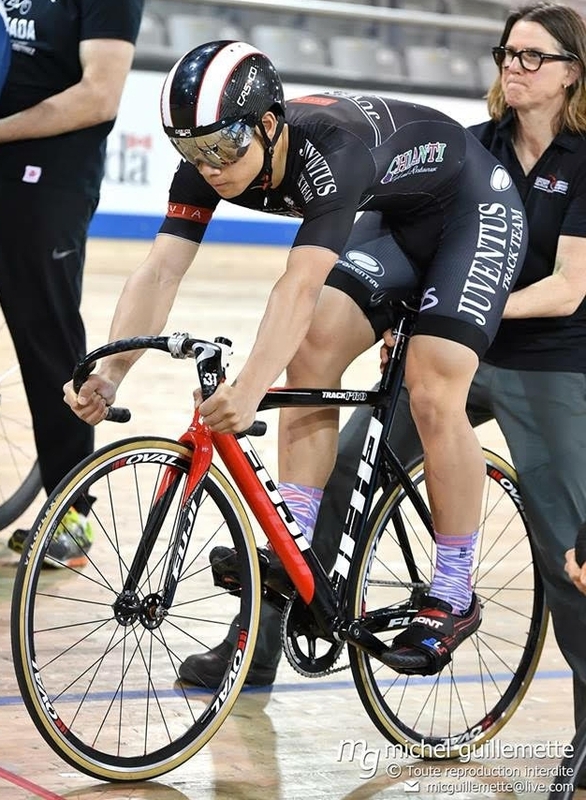 She also raced to silver in the 500 TT, and bronze in the IP, Keirin, and Match Sprint. Ngaire also teamed with Annie Scott and Quebec for a Team Pursuit, and Annie for Team Sprint. A great feature of all Canadian Championships, is the opportunity for riders from different provinces to join together for team events. 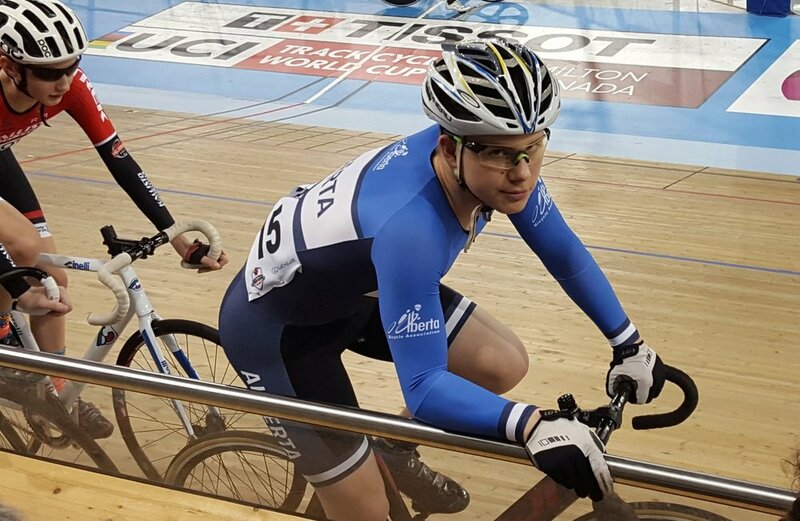 Mikael Goh teamed up with 2 Quebec riders to win silver in the U17 Team Sprint! Throughout the weekend, Adam Todd supported the team with thoughtful advice, track knowledge, mechanic skills, wheel management, and his unique calm when things seemed to get a bit crazy. Adam provided an extremely appreciated overall confidence to the Juventus pit. At the first TL! of the season, our future elite gathered to thank Adam for his superb assistance in Milton. Mat, Ngaire, Lukas, Chris, and Annie enjoy the sites during a break from racing. Upon return to Edmonton, a few of our racers were able to respond to a selection of questions. Enjoy! Milton is indoor, 250m, and wood; how does it compare to Argyll and how did you adapt? Lukas: Milton is amazing compared to Argyll. The smooth wood makes it super fast and a lot more comfortable to ride on. You raced many events; which was your favourite? Why? Mikael: My favourite event at nationals was definitely the Match Sprint. Almost all of my sprints were super tactical and I learned a lot about my own strengths, and how I can apply them in future races. Tanya holds for Mikael's Match sprint bronze medal round. Ngaire: The Points Race was my favourite event because I left everything I had out there, and was successful. It was so fun because the competition was really strong and I felt like I had worked as hard as I could. However, I was also surprised with how much I enjoyed the Individual Pursuit. It was really painful, but I hit my goal for that event so I felt accomplished and I also felt really strong while riding it. Ngaire goes for the win! Every race is an opportunity to learn; did you try something that didn't work? What would you do next time? Ngaire: Since I had only done most of the races a couple times before, I felt like I was always trying new things. In the scratch race I attacked with two laps to go - and it did not pay off. I was fairly sure I couldn't hold it, but I wanted to make a move and it was worth a try. I ended up getting caught just before the line, so I think in the future I would try and sit in the pack a little more. In the elimination race I raced off the back and sprinted for each elimination and that definitely didn't work because I found it exhausting. And in my sprint finals, Tanya and I decided that I needed to make the attack and lead the sprint, which ended up working really well and I was happy I tried that. Alberta Provincial Coach Tanya Dubnicoff helps Ngaire get set for her Match Sprint final. What was your favourite thing about Milton? Lukas: My favourite thing about Milton is that it's indoors. While the heat may be a bit much at first, the controlled climate year round, with zero wind, is awesome. Lukas ready for the neutral lap. This is your first experience at Junior/U17 Nationals; what did you think of the competition? Ngaire: I thought the competition was really fast which created a fun racing environment because every race was really tight. One of the supports Juventus made available to the team was our Track Equipment Manager and mechanic, Adam Todd. How did Adam assist you? Mikael: Adam was a huge help. He always had equipment and tools on hand, and it was really helpful for him to bring my bike to bike check while I got ready for my races. Lukas: Adam was extremely helpful, running bikes through bike check, swapping wheels, and making sure tires are always full. Without him we would have had to spend more time worrying about our bikes than preparing for our races. What advice would you give a first-timer to the Mattamy Velodrome in Milton? Mikael: The track isn’t something to be scared of. Mattamy Velodrome is really grippy (so you’re not likely to slip off the banking) and the corners don’t feel nearly as steep as they look when riding it. It takes no time at all to get used to it, and once you do it’s super fun to hit speeds that you can’t on our bumpy concrete track. Many competitors listen to music on their headphones before a race. Who were you listening to? Lukas: I never listen to anyone specific; I just find upbeat, loud songs to pump me up so I'm ready to go for the next race. Ngaire: I was listening to Pitbull. Do you have a special food you eat at races? What is it? Ngaire: I find it really difficult to eat at races because of my nerves, however I tried gels and they actually worked really well for me, so maybe that's my special food now. Finally, we have to address the excitement of the last day of competition when the infamous Madison was raced. Naturally, this is quite a challenge for Juventus riders, as there is no opportunity to practice exchanges through winter months. Well, suffice it to say we have 2 young men, Mat and Chris, who will return next year ready to race the full Madison. In fact, prepare for this to be 'The Summer of the Madison'!! Chris and Mat anticipating the Junior National Madison Championship! Some of our Juventus youth were able to take advantage of an extra week in Milton for a Cycling Canada Development Camp! Posted on May 4, 2018 by @Juventus Cycling .